This mixed metal ring pairs a sun and crescent moon for star-gazing style. 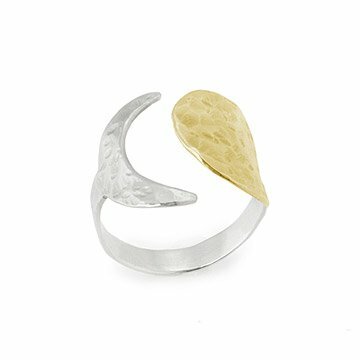 This mixed metal ring pairs a sun and crescent moon for star-gazing style. Its hand-hammered texture invites light and shadow to play across its surface and accentuates the astronomical design. Simply pinch or expand for a custom fit. Sterling silver and 14kt gold plate. Handmade by Melissa Frost in Pennsylvania. As soon as Melissa took her first metal-smithing class and saw how metal can be melted, annealed and reformed, she was fascinated and hasn't been able to stop since! Melissa accepted an apprenticeship and having access to new equipment gave her the opportunity to look at her process and find different ways of creating. Melissa learns every day on the job whether it's iterating on a design or learning a new design software. Melissa finds a lot of her inspiration at the intersection of metal laser cutting, 3d design and traditional metal-smithing. The combination of these practices embraces the present with a respect for old and new techniques. And it's Melissa's hope that through this transformative hybrid process, that every piece be a reminder of something, some place, someone or some feeling to be thankful for. A quick dip in jewelry cleaner, then rinse thoroughly under cold running water. A polishing cloth can be used on the silver area only, let the gold plate air dry. Keep your jewelry looking new by always making it the last thing you put on and the first thing you take off.